When you throw some sweets on the grill, magic happens, according to Valerie Gordon. Valerie Gordon, the mastermind behind LA’s own Valerie Confections, loves to experiment. While traveling through Texas, Gordon fell in love with the rituals of Southern barbecue. She watched as large groups gathered around a grill, pulling off bits of meat to snack on while they talked. She began wanting to contribute her own expertise to the grilling world. But when she looked up BBQ-ready confections, all she found was grilled fruit. Not good enough, she thought. So, she began playing with cast iron skillets and Big Green Eggs (and of course, sugar!) and was wowed by what she ended up with: puffy, light clafoutis and smokey, gooey brownies. Now she’s sharing her new favorite desserts with curious pitmasters. Try this brownie recipe on the grill this weekend! If you are interested in learning how Valerie Gordon does it first-hand, she’ll be grilling up confections at BBQ Bootcamp, September 26 through 28. P.S. A tip from Valerie: Try a heavy dose of salted French butter for these brownies for an irresistible taste and texture. Combine dry ingredients: In a small bowl, whisk together the buckwheat flour, salt, and baking soda. Melt butter and chocolate: In a heatproof bowl, set on the grill over indirect heat, or in a saucepan over medium heat, heat the 1⁄2 cup butter, chocolate, and canola oil until the butter and chocolate are melted and the mixture is smooth. Set aside to cool. Add eggs and sugar: Beat the eggs, golden brown and granulated sugars and vanilla in with the chocolate mixture until thoroughly combined, then add the dry ingredients. 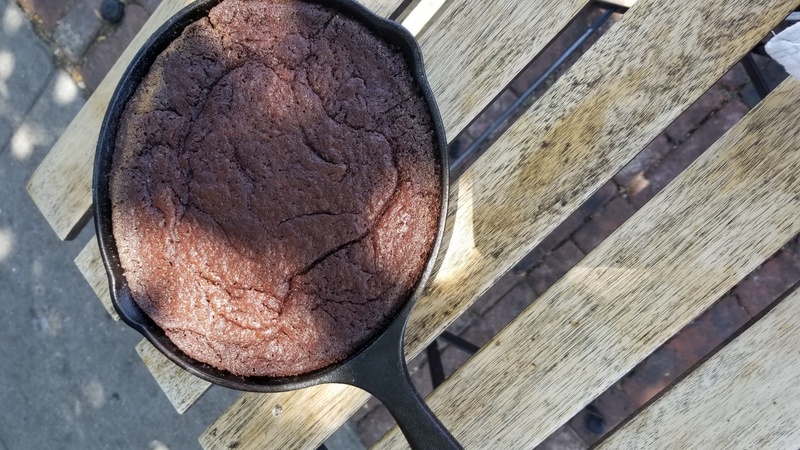 Prepare pan: Grease a 10-inch cast iron or other heatproof skillet or the individual compartments of a cast iron muffin or mini cake pan, with melted salted butter. Add the batter (dividing it equally if baking smaller amounts) and leveling out as needed. Grill time: Bake the brownies in a closed grill over indirect heat (or in a 350-degree oven) until a cake tester comes out almost clean (it will have crumbs but should not be wet), about 30 minutes, depending on the size and shape of the brownies. Cool before removing from the pan.